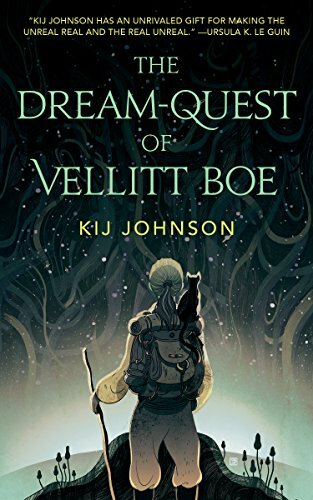 I read Kij Johnson's The Dream-Quest of Vellitt Boe with my feminist science fiction book club, and it's the first book I've read that made me really love being in a book club. I'm not very good at book clubs because I don't like reading books because I have to read them. But feminist science fiction is a pretty great space, so it's not hard to get excited about reading for each meeting. Also, the women in the club are so cool. Anyway, onto the book! I really enjoyed The Dream-Quest of Vellitt Boe when I read it, but it was only after our book club meeting that I realized on just how many levels it is fantastically feminist. For such a slim volume (about 165 pages), it really packs a punch. Especially when you compare it to its inspiration, HP Lovecraft's The Dream-Quest of Unknown Kadath, which I tried to read prior to reading this one, and just could NOT get through. If I had read the entirety of Lovecraft's book, I probably would have even more thoroughly appreciated Johnson's version of it. But I would say I read enough of Lovecraft to know that I didn't want to read any more. Where Lovecraft seems to have no real focus except in introducing as many bizarre characters and species as possible, Johnson gives readers a more internal focus on Vellitt Boe herself. While she is not particularly introspective, we learn enough about her to want to know even more about her. Vellitt Boe is a professor at a women's college in a dream-world. One of her students has run away with someone from "the real world," and Vellitt must go bring her student back. She embarks (with zero drama) on this quest on her own, knowing that it could take a very long time and will probably be super-dangerous. But Vellitt is someone who does what's right, and so she hops to it. 1. Vellitt is middle-aged. She's a middle-aged adventure heroine! You do not find those around very often at all, and I just love that making Vellitt middle-aged and female is in itself a completely feminist way of setting up this story. She is aware that she used to be super-attractive and that she used her charms to get her way and that, being female, her attractiveness lessens with age. But she doesn't really miss her past, she is happy with who she is. There's also this whole interplay with a former lover who does not look like he's aged at all, and the way they look at each other and how Vellitt reflects upon him and their past relationship is just brilliant. 2. Vellitt is "ethnic." Ok, ok, I admit I TOTALLY did not catch this when I was reading the book. Ironically, the two POC in the book club defaulted to thinking Vellitt was white, whereas everyone in the book club who was white was really quick to catch onto the fact that Vellitt had skin "the color of mud" and hair she wore in braids. Oops. I don't think the race component in this book is as strong as it could have been, considering the author pointed out at the end that she wrote it partially to counteract the racism in Lovecraft's book. I feel like if I missed it, it was pretty subtle, but maybe I am just not as attentive a reader as I thought. ALSO, I would say that, based on that description, the cover of this book feels a little white-washed. Maybe that is gray hair, but it's definitely not in braids. 3. The girl who ran away from school is amazing. She doesn't play a huge part, and, seeing as she's a beautiful college student who ran away with a boy, you'd think she'd be pretty flighty and lame. But she is not. She's strong and straight-forward and everything that is great. 4. The setting. Vellitt Boe's world is capricious and mercurial and does not obey the laws of physics. We don't get a ton of detail about the world because, well, the book is 165 pages long. But what we do get is fascinating. For example, the sky is never the same color, it seems to roil and boil all the time. There are exactly 79 stars in the sky. There are gods, and the gods are not very nice. While trying to make my way through Lovecraft's book, I felt like he just kept going ON AND ON with no point at all. While reading Johnson's book, I felt none of that. I am not sure why because really, many of the plot points are the same and Vellitt goes on essentially the same journey as was laid out previously. But I think a lot of it has to do with the way Johnson describes the setting and gives us a little background on the characters that Vellitt encounters. Sounds like I've got to read this. I've loved all the stories I've read by this author, and when I met her in person (at IFCA), she was absolutely wonderful. I'll bet she is! I have not read anything else by her, mostly because I think she writes books about animals? Or people who are also animals? I have some sort of vague idea that she writes a lot of animal-based fantasy. Which I am not very into. But maybe should make an exception. I just read it. Wow. That was pretty depressing. An excellent intro, though, and I see your point! Hey lady! I am pretty sure HG Wells did not write The Dream Quest of Unknown Kadath, it was HP Lovecraft. Ohmigosh. I blame jet lag. I have not slept properly in a week. Yikes. She does, sortof, write about animals, The Cat Who Walked A Thousand Miles was the first story by her I read. I think I understand your "sort of" based on Jeanne's comment above - I'll check out another by her! This one sounds awesome on so many levels. I have not heard of it and I have never read any of Lovecraft's books (and I want to read them even less now). So I will be looking for this one. I think Lovecraft probably wrote other books that were good, as he's so famous, but even he did not love this one and I don't think he edited it to completion - I believe it was published after his death. A feminist sci-fi book club sounds awesome! I look forward to hearing about the other books your club will pick. I haven't heard of the author before. I read a sci-fi book recently where I was pretty sure the main character was a POC though the descriptions were subtle, but one of the book covers definitely made her look white, so I was uncertain in the end. Ooh, which book was that one? I have this one so I just read the first part of your post. I will have to come back and read all your insights once I get around to it! The feminist science fiction book club really is pretty amazing. I highly recommend joining or forming one! I had The Fox Woman on my Amazon wish list for YEARS and never got it or tried to read it but I think I shall try now! Ahhh, I'm super excited to read this one. It's been on my "want" list for a long time. Feminist science fiction is a thing I'd like to become an expert in. Also, your book club sounds great! I am not great at book clubs either, so I only show up to mine (which is a young adult one) every 2-3 months, and I hardly ever read the book. But it is nice to meet smart ladies who like to read in real life, so it's usually worth it.